Community Voice Summit: Come join us at Opportunities every Monday and Thursday for Ready, Fit and Able! Come join us at Opportunities every Monday and Thursday for Ready, Fit and Able! A Wellness & Recreation Program Tailored to the Needs of People with Disabilities. 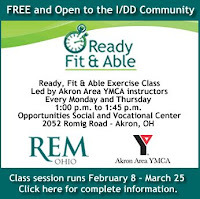 The class will be led by Akron Area YMCA staff members every Monday and Thursday, from 1:00 p.m. to 1:45 p.m., and will feature low impact, aerobic exercises that can be adjusted based on an individual’s physical ability. Those in the community with disabilities are welcome to join us for FREE!